YorCar.com offers you cheap car hire in Faro, Portugal. Rent a Car in the Algarve. Our online prices are 25% lower than our normal rates. We are a Faro Car Hire and Algarve Car Hire specialists offering a wide range of quality cars including economic 5 doors, Family Station Wagons, Cabriolets, 4x4s, Jeeps, People Movers, Minibuses and confortable Mercedes. Our friendly staff will wait your flight to provide a fast delivery at Faro Airport parking, without queues or transport bus to outside offices. If you prefer, we may deliver your car at your accomodation in the Algarve, including Vilamoura, Albufeira, Lagos, Praia da Luz, Praia da Rocha, Carvoeiro and more. 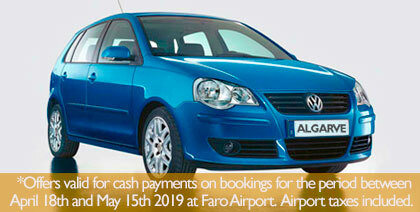 Get an instant Algarve Car Rental quote. Algarve Car Hire cheap prices - Click here! Rent a Car in Faro Portugal - Click here! Budget Algarve Car Hire - Click here! Car Hire Portugal Algarve - Click here!